I have been reading a lot more about personal style and how your home should reflect that in order to make it feel more like your own space. Take a look into your closet and look for patterns. I, for one, own a whole lot of white, pink, soft blues, and army greens. 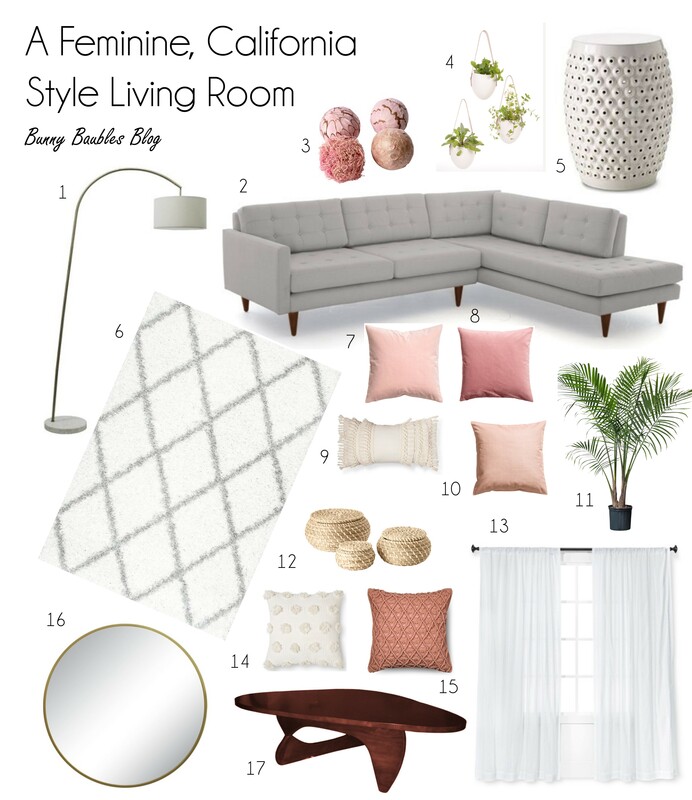 These soft colors, along with my love for mid century pieces, lend themselves well to a California style living room. Mid century inspiration for clean lines, low profiles, and tailored furniture. Natural items like woven baskets and fresh plant life. Light and bright spaces with color schemes taken from nature. A layered and textural approach for decor like curtains, rugs, and pillows. A less is more mentality. To create this calming and relaxed space, I’ve created a mood board for inspiration. By collecting all of the items together in one place, it is simpler to create a vision and determine what works together and what doesn’t. I’m feeling like it will make my space really calming and a perfect space to relax after a long day of work. What do y’all think? Any favorites from the list?